Kattimerka, (called katimeria in Greece), is a traditional Cypriot pastry dessert, similar to pischies but instead of being fried, these are cooked in a traditional frying pan called sadji. Sadji resembles like the Arab Saj, however, unlike the Arab saj, which is dome shaped, the Cypriot sadji resembles more like a wok. You can use a wok or any non-stick sautéing pan. The dough is rolled into thin phyllo and then it is folded into an envelope shaped rectangle and fried by just brushing the sadji or wok. If you don’t know how to roll out phyllo, if you have a pasta machine* it very easy to make. It’s much easier and they can be made in a matter of minutes, while the pan is heating. You will have a long piece of phyllo, which cut in the middle, join the two pieces together and follow the remaining instructions in the recipe. 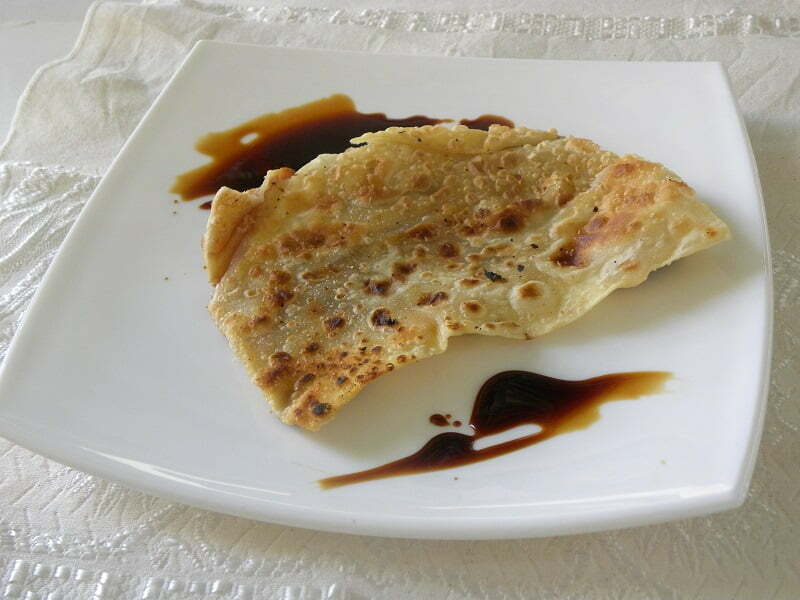 They are usually served with honey or epsima on top but they can also be served with carob syrup or just plain sugar. Epsima (in Cypriot dialect) and Petimezi (in Greek) is a concentrated syrup made from the juices of grapes, which dates back to antiquity. It is available in Greek and Cypriot deli shops. Teratsomelo or black gold as it used to called in the old days, is again a similar syrup made from the syrup inside the carob pods, which is a healthy substitute for chocolate. Divide it into ten pieces and roll out each piece of dough as thin as you can, either using a dowel or on the pasta machine*. Brush each one with olive oil and sprinkle with cinnamon. Fold it into an envelope to make it rectangular or fold it in the middle. Heat the sadji or other non-stick frying pan and brush it with olive oil. Cook at high heat on both sides, until the dough blisters. Serve them with honey or any of the other syrup, while they are still warm. Kattimerka, is a traditional pastry dessert, similar to pischies but instead of being fried, these are cooked in a traditional frying pan called sadji. Sadji resembles like the Arab Saj, however, unlike the Arab saj, which is dome shaped, the Cypriot sadji resembles more like a wok. You can use a wok or any non-stick sautéing pan. This and many more Cypriot recipes are included in my cookbook Mint, Cinnamon & Blossom Water, Flavours of Cyprus, Kopiaste as well as in Volume 2 of my e-cookbook, sold on all Amazon stores.